In Atlanta, more than 100 turkeys, nearly 400 pounds of nonperishable items and $1,300 in monetary donations were collected during the two-week drive, which ran from November 1 to 15. “MUST Ministries is not only a pleasure to work with, but a fabulous charity that serves those in need in the community,” said Bob Poole, a lead builder at David Weekley Homes. Locally, the Giving Thanks, Giving Back Thanksgiving Drive benefitted MUST Ministries, a nonprofit organization that partners with agencies across four counties to feed 250 individuals and families each week. David Weekley team members provided the collected items to MUST Ministries to distribute to families in time for the holiday. 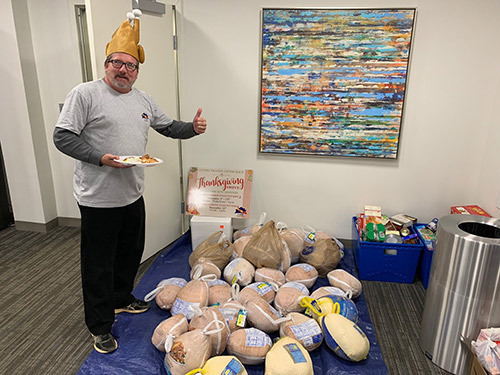 Team members from David Weekley Homes donated more than 100 turkeys, nearly 400 pounds of nonperishable items and $1,300 in monetary donations to MUST Ministries to benefit families in need.